Hammer & Steel sells, rents, and services a full line of vibratory hammers, also known as vibrodrivers and vibro hammers, from leading manufactures. 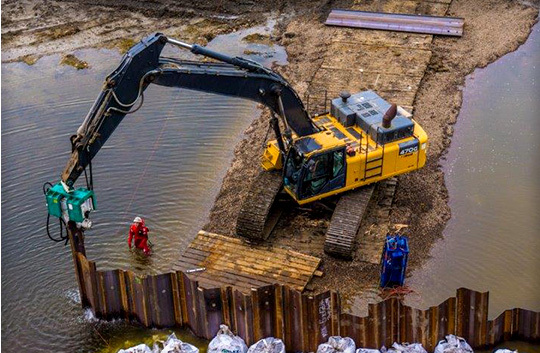 The durable, reliable vibratory hammer equipment produces vertical vibrations to drive a variety of profiles including steel sheet piles and H-piles. 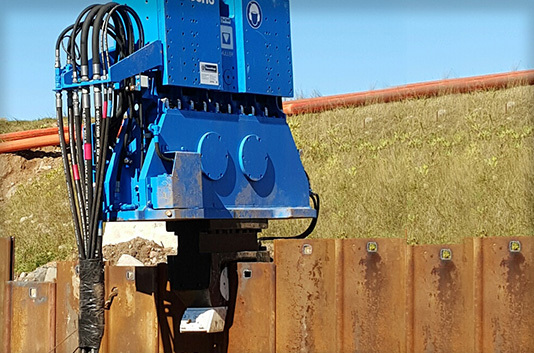 Our proprietary line of vibratory driver/extractors are perfect for a wide variety of general purpose pile driving tasks. Hammer & Steel sells, rents, and services German made Müller H-Series and HFV-Series vibratory hammer equipment in North America. 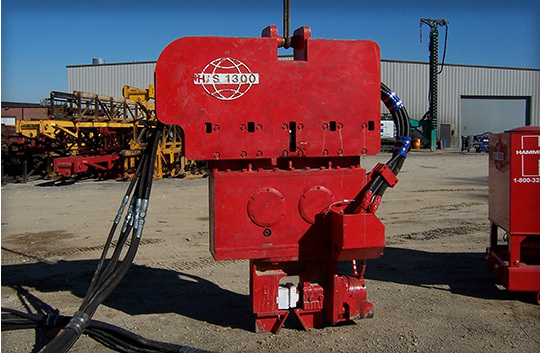 PTC Vibrodrivers are extremely durable and efficient hydraulic vibro hammers used for pile driving and extracting. 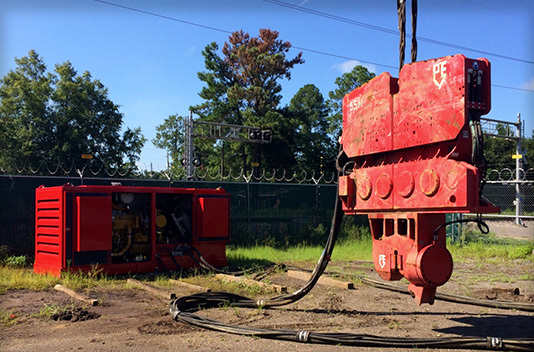 PVE is known for building high horsepower vibratory pile driver/extractor systems that get the job done reliably even in the toughest driving conditions. 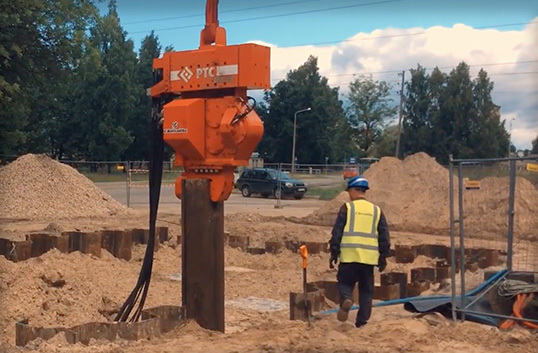 The Mobilram vibratory hammer with adjustable static moment is suitable for the piling and extracting of steel sections such as sheet pile walls, H-beams and pipes as well as alternative foundation methods like vibro, cast-in-place, gravel, and sand piles. The model HVR vibratory drivers/extractors combine high frequency vibration and excavator crowd/retract forces to deliver impressive driving and extracting capabilities. 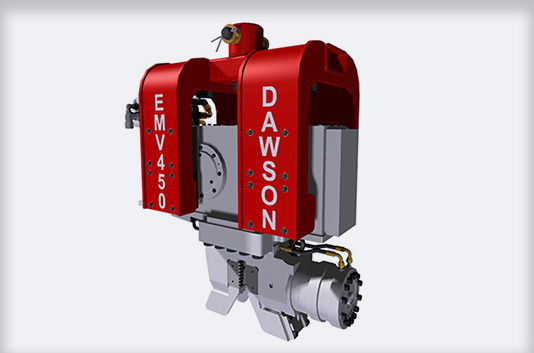 The Dawson excavator mounted vibratory pile driver is the perfect tool for driving relatively short piles in sands and gravels. This high powered excavator mounted pile driver has a slim design which allows for easy driving of steel sheet piles.